My friend Tom sends along a Google Nwords graph showing the rise of copyright relative to patent in Google's database of books. This is consistent with the idea that copyright is looming larger and larger in our minds, as the term of copyright keeps creeping up. 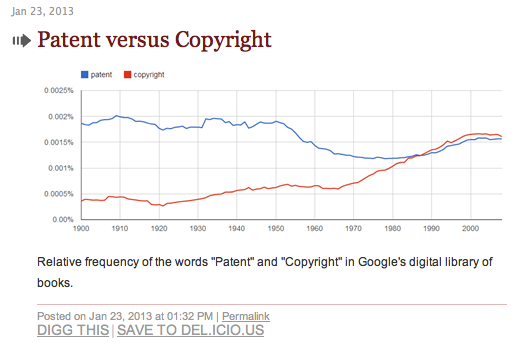 Perhaps also as the perceived value of copyright keeps creeping up. Following on the heels of Aaron Schwartz's suicide after his pillorying by the Justice Department, I thought again: why is so much publicly funded research in the US is not readily available to the public? I agree with Jerry Pournelle, I like intellectual property, since that is how I make my living, but it also seems to me that the public owns what the public pays for, and most research in the US is at least partly funded by the government. I am not a lawyer, so I don't know all the relevant legal principles at work. I do know that work produced by employees of the federal government cannot be copyrighted, and also that university researchers would not be considered employees of the federal government, because they work independently, hire their own, assistants, etc. I clearly see that the law as it stands would not require that publicly funded work belong to the public. However, as a matter of public policy, why not? For working scientists, normally paying journal access fees is just a cost of doing business, er... science. However, exceptions are not unknown. Climate researchers often find themselves bombarded with requests for their data from climate cranks, to which the usual response is scorn and stonewalling. Yet for all that, I think the climatologists should cough up their data if it was paid for by the public. If you take the King's coin, you also get to be accountable to the King's nutty subjects. I understand the annoyance of the scientists, who feel their time is wasted by such things. However, I cannot see the benefit to the public or to science in general by acting as if publicly funded research, often done at a public university or research institution, belongs to the researcher alone. Especially when the research is claimed to be important, as climate scientists are wont to do. This is especially true since scientists don't make money off of journal articles. The point is fame. I can see a slightly different argument in the distinct, but related subject of patents at public institutions. The point of a patent is to encourage investment in a new technology, and the term is pretty short. This process seems to work pretty well at helping take ideas out of the lab and into the marketplace, and many researchers stand to gain handsomely from patents. The term on copyright is much, much longer, and at least in the case of journal articles, it seems less and less critical to enforce that copyright as the science ages. 50 years in, most of those articles will be completely unknown, and not really relevant to the progress of science.